He is an unlikely leader: a Catholic poet who claims to need "just 40cm of space" to work on his writing. But the killing of his 24-year-old son, Juan Francisco, last month, in an episode blamed on drug gangs, has made Javier Sicilia the loudest voice condemning the violence that has ravaged parts of Mexico. "I'm not a political animal," Mr Sicilia tells the BBC in Mexico City. "I'm a moral voice - I have to do this out of my moral convictions, because people have asked me to do it." His harsh criticism of what he calls President Felipe Calderon's "stupid strategy" to fight drug cartels has resounded with large sections of Mexican society who are increasingly frustrated by the rising violence in many parts of the country. More than 35,000 people have been killed since Mr Calderon launched a military confrontation with criminals in late 2006, and the violence shows no sign of abating. So when Mr Sicilia, who also contributes to the Mexican news magazine Proceso, called for a series of simultaneous marches around Mexico to protest against the violence earlier this month, people responded. Thousands took to the streets in Mexico City, around the country and even outside some Mexican embassies with the rallying cry "Estamos hasta la madre! ", a colloquial expression meaning "enough is enough". Mr Sicilia, while still adjusting to the huge media coverage his personal tragedy has generated, seems to view his new role not as an option, but an obligation. "I have to show my face for my son's dignity, for all the sons who have died in this battle and those who will die in the future," he says. 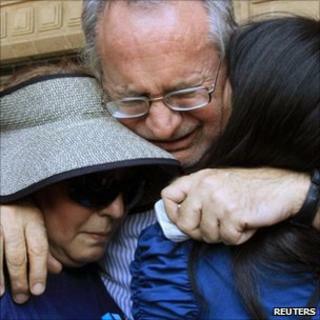 Mr Sicilia was working in the Philippines when he first heard of the murder of his son and six others in Cuernavaca on 28 March. Their bodies were found in and around a vehicle - some showed signs of torture. No-one knows exactly why Juan Francisco Sicilia and his friends were targeted. The only arrest made in connection with the case did not shed any light on the circumstances of the killings. And that is why many, including Mr Sicilia himself, have linked the murders to the general violence that has engulfed the central Mexican state of Morelos, where Cuernavaca is located. The area is said to be at the core of a battle between rival drug gangs and organised crime groups. More and more innocent civilians like his son are being killed as "collateral damage of the drugs war", Mr Sicilia believes. So he focuses his criticism on President Calderon's strategy. "I think Felipe Calderon is responsible for launching a war in a stupid way," he says, combining rage with frustration. "What this war has done is allow the corruption of institutions which had been taking place for years to emerge, but leaving those institutions completely defenceless to face organised crime." Mr Sicilia has himself been criticised for focusing his anger on the government rather than on the criminals blamed for the original problem - using Mexico to transport narcotics into the US and devastating some of the areas used as smuggling routes. President Calderon - who received Mr Sicilia at the presidential palace after the murders - made an overt reference to the issue in the wake of the demonstrations. "Let us not be confused," said Mr Calderon at a lunch with business leaders earlier this month. "We should say 'Enough!' to the criminals who kidnap and murder. They are the enemy, not those who fight against them,", he added. For Mr Sicilia, the conflict has reached a level that requires a more comprehensive approach to the issue - one which includes the commitment of all Mexicans. "We need a national pact because this is an emergency, and we have to rebuild the tissue of this nation - if we do not, we are going to enter hell." As for his poetry, Mr Sicilia has decided to silence his voice. His last poem was dedicated to his son, and was written just hours after the violent murder. "Poetry does not exist in me anymore," it ends.